MTV News recently sat down with the Fox bashing Rob Liefeld, who notably told 20th Century Fox via his twitter to "find their balls and get their act together" over their big screen adaption of his creation "the merc with a mouth" Deadpool. Liefeld via MTV expands on his tweets using his face. MTV:So... Rob... read any good blogs about what somebody said on Twitter lately? "Well, what I believe is, if you're talking on Twitter, you're talking out loud, but sometimes you go, Really? This is news?" So let's get right to it. What's going on or not going on with Deadpool these days? "With the "Deadpool" film, it really boils down to to this: all the ingredients are there. What's the wait? I watch everything just like you do. You cover this business, and so do I as an interested party and a fan and somebody who has other films going. You look at development slates and what's going forward. You know how many people would kill to have Ryan Reynolds star in their movie?" "You know what they say about "if it's not on the page, it's not on the screen"? Well, it's all there on the page. That script is brilliant. It doesn't need any adjusting, it doesn't need any vetting, it's just brilliant. It's like nothing else that's out there. Anyone who's read it knows that this is the comics film we've been waiting for. It has all the action, the violence, and the unexpected original set pieces that you haven't seen but want to see. It has character, it has heart, and it's laugh-out-loud funny. So you can't help asking, what's the holdup here? Is "Deadpool" not on the priority list? I really do not think they understand what they have here." Is it because Deadpool was such an unknown commodity in the mainstream world before "X-Men Origins: Wolverine"? Why is there such a holdup?" "I go to the conventions and travel the country every year and I'm deluged with people dressed as Deadpool — people who are dying for this. These people have created such a phenomenon that Marvel has five or six "Deadpool" books a month. I want to say, "Hey Fox, last I counted, that's more than Spider-Man! "It's not like I don't live in southern California and have management and agents in this town. It's not like I don't hear things around town. If it's an issue of Fox being cheap, what's that about? Open up the pocketbooks. Between a smaller budget and a bigger budget, they might want to go bigger budget — history will tell you that. They should spend what they need to get a director and lock down the star. They have Ryan Reynolds and Reese and Wernick, who if you haven't noticed, are tearing up the town. There's a reason everybody wants them. Fox has the script that everybody thinks is their best piece of work." Well, it seems like you're not finding much argument with what you said on Twitter. "People want this "Deadpool" movie to happen, and everyone seems to like Reynolds, Reese, and Wernick on it...It's like this: If you have a voice and you do nothing with it, then you only have yourself to blame. I go to these conventions and my signature on a "Deadpool" book makes it go up an obscene amount of value, so I'm partially saddled with this situation, too. 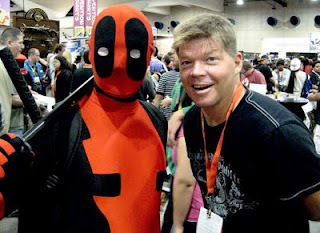 "Hey Liefeld, when's 'Deadpool' coming out?!" You know how often I'm asked that? But I don't have a green light on this..."
I'm reading: ROB LIEFELD DISCUSSES WHY [DEADPOOL] IS BEING MISMANAGED BY FOXTweet this!